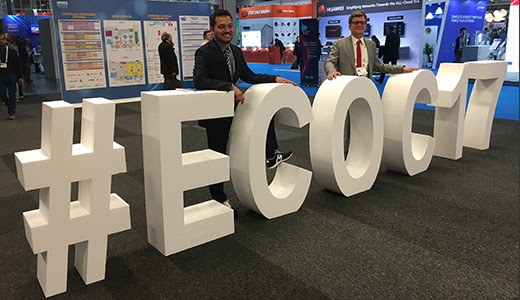 At the post-deadline session of ECOC 2017 on Thursday, September 21, 18 contributions have been carefully peer selected by experts in the field to present the latest breakthrough results from labs all around the world. The 18 presentations are all exceptional contributions to the field of optical communications, and show the true frontier of the field. One of the major achievements include breaking the record for how much data can be transmitted through a single optical fiber. In a heroic effort, researchers from Japan have managed to break the current record by a factor of 5, reaching a mesmerising total transmission of 10 petabits (10 million gigabits) per second using over 100 spatial channels. In another major breakthrough, the all-important capacity-distance product had a new record set by transmitting 51 terabits per second over no less than 17.100 km of fibre. Finding new ways to increase the transmission capacity of optical fibres include using spatial channels, and a capacity-distance product record for multi-mode fiber transmission was achieved transmitting 138 terabits (138 000 gigabit) per second over 650 km. Another approach to increase the capacity is to use new frequencies, also known as optical wavelengths, and for the first time the three different wavelength bands referred to as S, C and L bands were used to transmit 115 terabits per second over 100 km simultaneously. Making smaller and faster components is always on the agenda, and the emphasis in the device area has been on integration of transmitters and receivers. The post-deadline session will see very high-density monolithic integration, as well as new hybrid integration schemes. Both are used to support advanced modulation formats as well as high baud rates, so expect a session filled with exciting new device results. These range from a 784 gigabit per second four-channel hybridly integrated transmitter and a two-channel 32QAM polarisation multiplexing monolithic transmitter-receiver pair running at a rate of 100 gigabaud (100 billion symbols per second), to a new print-transfer technology for hybrid integration of high-speed waveguide devices, as well as two novel modulator concepts, one of which includes a C-band tuneable laser. The way data is encoded onto light and controlled in optical networks has taken some impressive steps forward. The first demonstration of a single optical carrier directly modulated to carry 1.32 terabit per second will be presented, relying on the latest developments in digital to analogue converters running at a rate of 66 gigabaud and enabling 1024 QAM modulation. On the receiver side, a simple direct detection scheme only needing a single photodiode will be presented relying on the Kramers-Kronig receiver principle. On the control side, software defined networking (SDN) has grown to another level of maturity as spatial channels (SDM) and machine learning are being introduced in the scenarios of optical networking, in particular 53 terabit per second switching node was achieved based on SDN and SDM. A fibre-based front-haul system for mobile application is demonstrated to carry the equivalent of 1 terabit per second, exceeding the previous record by approximately 3 times. Such high capacity front-haul systems can lay the foundation for ultra-high mobile connectivity to remote radio heads. 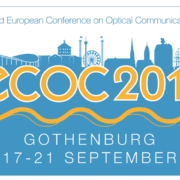 On this coming Sunday, ECOC 2017 finally starts in Gothenburg, Sweden, with a full day of workshops. The attendance is already very high, we estimate about 1100 participants, and the Exhibition is sold out for the first time since the heydays in 2001! 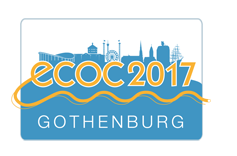 Check out the final programme at ecoc2017.org – and the Postdeadline is excellent. Gothenburg is a charming and friendly city with everything within walking distance, giving you an extremely efficient combination of technical and social exchanges with the latest and greatest in the field. See you in Gothenburg next week!